Sussex Cricket Premier League umpire Mark Newell has been named on the Reserve List of First-Class Umpires for the 2017 season. The former Sussex batsman and Three Bridges captain was named alongside James Middlebrook as additions to the list this year. The eight-strong Reserve List are there to support the 25-strong First Class panel. And the 43-year-old is delighted to have progressed to this level. He said: “I’m very chuffed about it, it’s a good bit of news. It’s the second tier of professional umpiring that supports the first class group. Newell will run the umpiring side-by-side with his job at Gatwick Airport but his long-term aim is to do umpiring full-time. He said: “Next step is to get on to the full list but a degree of patience is required because a lot of those guys go through to retirement age. 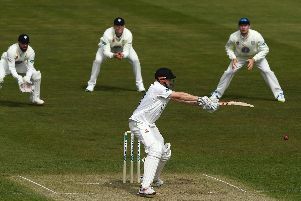 Batsman Newell, from Crawley, played 24 First Class games for Sussex and Derbyshire, hitting three centuries before returning to play for Three Bridges. He said: “Umpiring wasn’t on my mind when I came out of the professional game. I wanted to stay in cricket so I went back and played for Three Bridges. “It’s when I got to my mid-30s I started to think about the next phase of what I wanted to do with cricket as my playing career was winding down. “I had a chat with a few of the local league umpires like Tony Millard and Terry Burstow and they talked about umpiring as a way forward and I liked what they said and it went from there. “They gave me guidance on how to progress and guided me through the early stages. Certainly the Sussex League has been very good to me in terms of pushing my progression through quickly. Newell believes having played First Class is a big help to umpiring at the higher standard. He said: “It certainly helps. “It gives you an understanding the kind of pressures the guys you are umpiring are going through and that gives you a certain amount of empathy with them. And what advice would Newell give to any one looking to progress in the umpiring world? “Look for guidance. Seek out guys who have progressed up the ladder and ask them how they got there, what kind of commitments you have to make to progress and listen to what they have to say. Chairman of the Sussex Association of Cricket Officials Terry Burstow said: “Besides being a very good batsman I found Mark to be a very thoughtful and intelligent cricketer when he captained Three Bridges. “He used these attributes as he moved steadily through the umpiring ranks. “His calm nature has provided the ideal base for clear decision making which is a huge benefit in umpiring.